The beer market is a big one, making it hard for brands to truly stand out. That doesn’t seem to be a problem for Guinness, however. 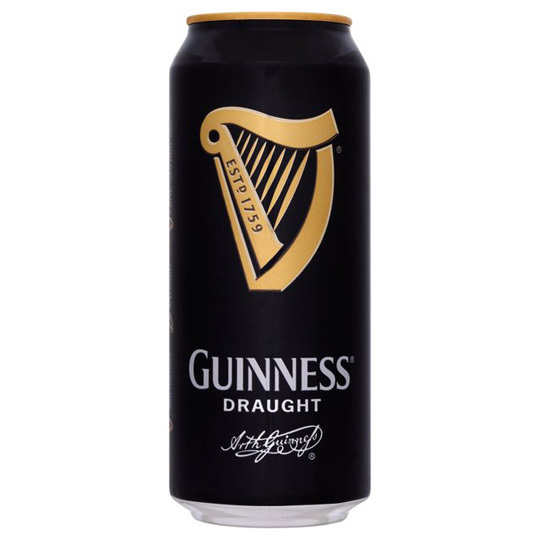 With its distinctive tall black can, gold harp and white accent elements, it’s an eye-catching, attention-grabbing piece of beautiful packaging. It’s not an easy feat to achieve in a crowded market, and that’s why we’d like to add Guinness to our favourite iconic packaging brands. With a history stretching back to the 1700s, we’re going to concentrate on more modern packaging choices in the Guinness line-up. But, these particular choices still pay homage to the extensive history of this iconic, historic brand. In their quest for the perfect vessel to house their beer, Guinness has created some wonderful packaging. A tall, striking can that’s stood the test of time, literally standing above other beer cans. Over the years, it’s gone through many looks, each time refining what a can of Guinness should best look like. Eventually settling on the black and gold we all know, each can iteration has pared down to the best elements of the Guinness personality. Today, the golden harp sits across a field of deep black. It’s the perfect example of packaging progression, subtracting what doesn’t need to be there, while dialing up what deserves all the attention. 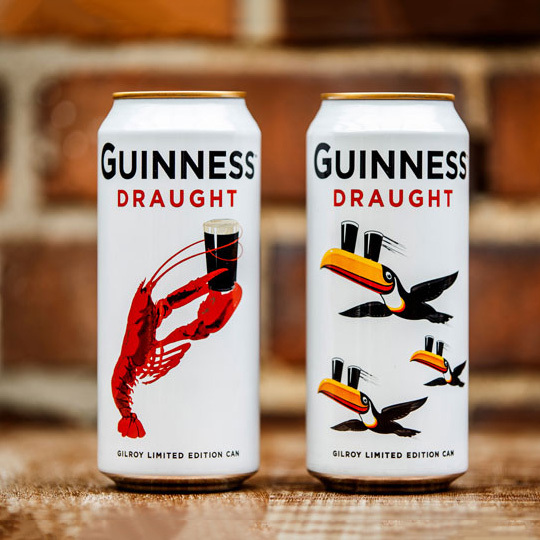 In 2017, Guinness released these cans for the 120th birthday of artist John Gilroy. He illustrated Guinness’ most iconic ad campaign, “My Goodness, MY GUINNESS!”, about a hapless zoo keeper. Running from the 1930s to the 1960s, it was one of the world’s longest-running ad campaigns. His most famous illustration was the toucan, in addition to a lobster, and a grinning sun and pint glass. The limited-edition cans retain the standard modern-day shape, while restoring old branding that was used decades earlier. It’s the perfected tribute to both their branding and the artist that helped shape them. Guinness has long been a global brand, and one not afraid to spread out and experiment with new things. In 2016, they debuted new English Porters using recipes dating back to the 1800s. 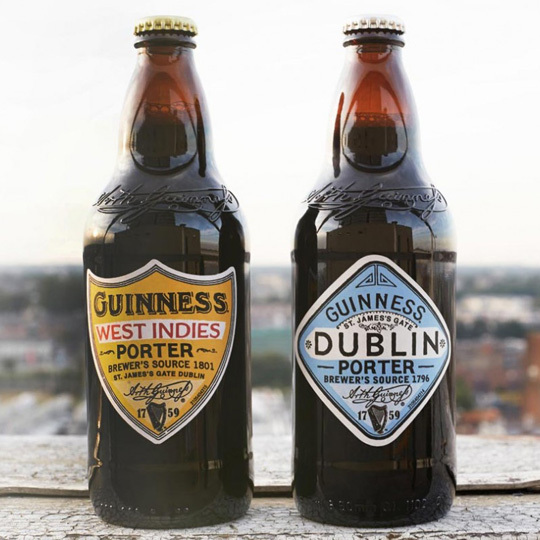 The Dublin version is based on a time when Porter was considered a working man’s beer after a long day’s work, while the West Indies version is based off an 1801 diary entry for the first Guinness brewed purposely to maintain freshness and flavour on long sea voyages to the Caribbean. Both bottles are thick, built to be substantial in the hands, while the labelling brings in elements that were popular in both areas of the world at the time. A modern way of looking back. 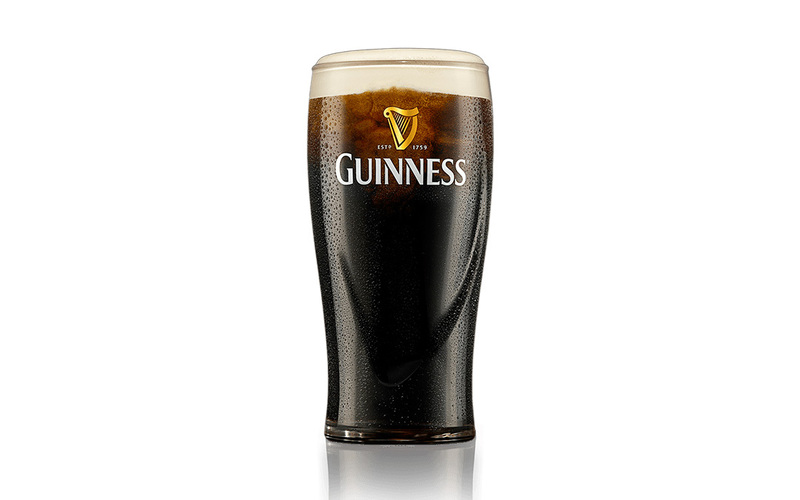 In 1759, Arthur Guinness signed a lease to turn St James’ Gate in London into a brewhouse. This was the start of a long and storied history, and absolutely something worth celebrating. To do so, Guinness brewed a special edition batch of beer, the first created in the newest brewhouse at St. James’ Gate. 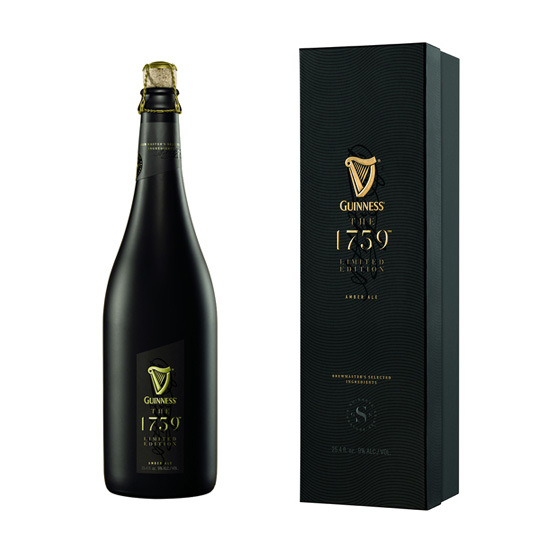 Bottling it up in a long-necked champagne bottle, while retaining their signature black and gold colours, Guinness released a spectacular-looking bottle of beer. It’s a brilliant, statement-making example of iconic packaging. To connect to a new crop of consumers, while staying true to their heritage, Guinness embarked on yet another experiment in 2016. 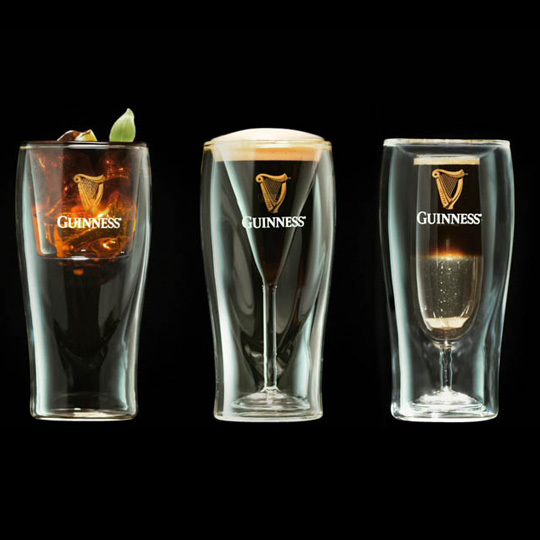 Creating Guinness-centric cocktails designed for modern day enjoyment, they developed glassware designed to best showcase their new concoctions. And since it’s known that Guinness drinkers will not accept their favourite brand in any other container than its iconic pint glass, Guinness smartly wrapped their new glassware in their long-standing pint shape. The perfect pint, the perfect cocktail. Packaging that can be picked out of a crowd is what every brand strives for, and Guinness stands out in any room. We think its instantly eye-catching look makes Guinness worthy of the title of iconic packaging. Do you feel there’s any brand out there worthy of the title, too? Let us know on social media or comment below. The Packaging Company is always thrilled to hear from you.